I immediately requested an improvement to the data analysis facilities but aside from that, the infrastructure was excellent. Naturally an assessment of the playing staff is the obvious place to start when taking over a new club, but I prefer to focus on the backroom staff to try and get the best possible team in place. My objective here is to ensure that the pool of staff is as large and specialised as possible, rather than hire coaches who have a range of general but average skills. I was impressed with the Director of Football, who I mainly used to find new clubs for unwanted players. I never rely on a DoF to negotiate contracts, sign youth players or handle contract renewals. I was faced with a very poor youth squad at Trieste and I did not want to face the same situation again. 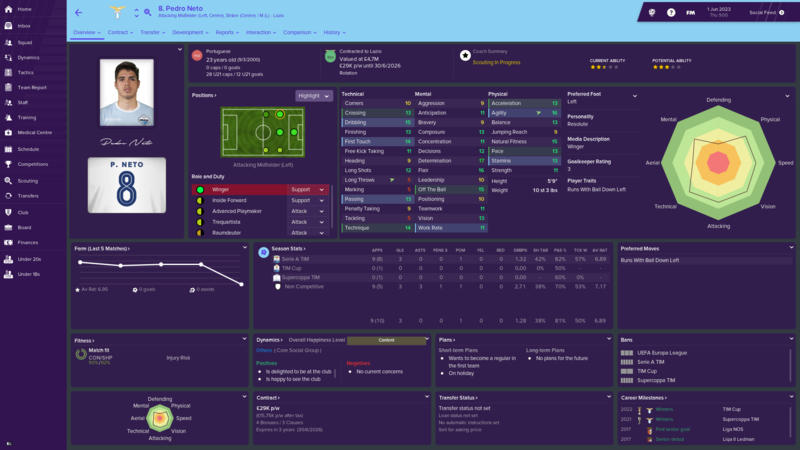 Jesus Perez joined as my new Assistant Manager from Espanyol, as I was impressed with his strict disciplinarian nature, as well as excellent motivational and man management skills. The staff was lacking in Attacking coaching, so I brought in Palladino from Trieste to improve in that area. The view uses the new “divider” tool which helps to break up and categorise the data that is shown on screen. Javi Martinez is clearly a talented footballer but at the age of 34 and earning £93k p/w he had to be disposed of. Upoin joining, he told me that he was homesick, so I arranged a deal for him to go back to Spain. This was an easy deal to do but unfortunately we would be subsidising his wage for another 12 months. However a fee of £4m and a £60k p/w saving in wages was good business. At 36, Lucas Leiva was one of the team leaders in the squad, but I felt that he had little to offer us. I was able to secure a free transfer for him to save the full amount on wages of £70k p/w. There was some unrest in the squad when this deal went through, but I was able to justify it to the players eventually. There was a good core of players remaining, but it was either approaching or the wrong side of 30. 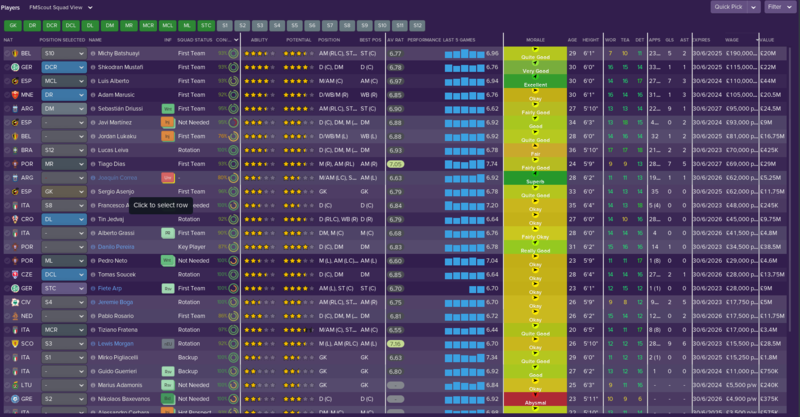 Taking into account a limited transfer budget of £2m, I would have to rebuild the squad over time rather than during one or two transfer windows. Luis Alberto is a superb option in either central or attacking midfield but only has one year left on his deal and being 30, I would soon have a very difficult decision to make. All aspects of his game are superb, so I would be loathe to lose him on a free transfer. His new contract demands are an extra £30k p/w which I am not willing to pay. Nevertheless, I had earmarked him for mentoring duties because of his high Determination and Teamwork skills. Tin Jedvaj is an excellent option across the back four and his flexibility certainly helped me out in early games. At 27 he has a further three years on his contract, so I didn’t feel that he merited a new one as his current deal will expire when he is 30. However it would take an extremely generous offer to tempt me into selling. 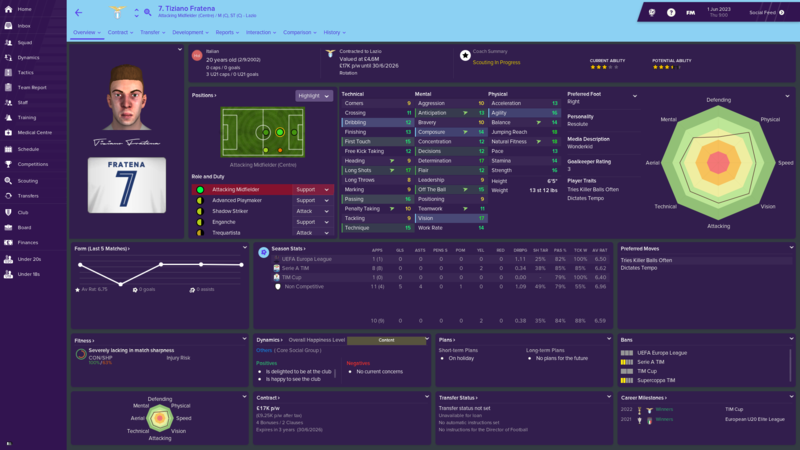 Tomas Soucek also has versatility and I deployed him as a central defender after taking over. He is tall and has excellent physical attributes, whilst central midfield was an area where we already had good options. He is earning only £28k p/w and therefore offers excellent value for us, although I wasn’t in a rush to offer a new deal. One of our highest earners, Adam Marusic is a very good option down the right hand side. I felt that he would be best initially at right back, but he can play further forward due to good Crossing, Off The Ball and Technique. His deal expires in one year therefore I would have a difficult choice to make. I am very loathe to give a bumper new deal to players aged over thirty. Jordan Lukaku was the first choice left-back and has excellent physical attributes, although I feel he is lacking defensively and can be often found out of position. He is attracting some interest from Newcastle, and would be happy to sell if I could get a fee close to his valuation. The highest earner at the club, Michy Bashuayi no doubt has very good attributes for a forward. Whether or not these skills merit £190k p/w is a matter for debate, but he would be my first choice striker. He would definitely not be offered a new deal, so I would most likely retain him for one more season. Shkodran Mustafi is a very good central defensive option but at 31 would not be the long-term future of the club. His deal has two more years to run on his deal and would most likely stay with us for one more season because he has very good defensive attributes. Sebastian Druissi is an another excellent option in attack, and the challenge for me will be to see if I can build a tactic to accommodate him and Batshuayi. He is being targeted by Bournemouth and if I can get an excessive offer, I may be tempted to sell. Alberto Grassi would provide cover in central midfield although I would certainly be looking to upgrade him over the next couple of seasons. Fabien Chapuis was out on loan when I arrived, but I felt that he had the nucleus of attributes to develop into an excellent striker in the long-term, especially due to his explosive pace and good Finishing skills. I have identified Tiziano Fratena as the long-term replacement for Luis Alberto. He has fantastic technique and is almost like-for-like with Alberto in a technical sense. I have asked Alberto to mentor Fratena to pass on his mental skills, although they are already excellent. Fratena would certainly become the cornerstone of the team and would represent Lazio’s future. Pedro Neto was transfer-listed when I arrived, but I felt that he had plenty to offer us in a creative sense. He is a good age and has time on his side at 23 to improve further. I believe that left attacking midfield would be his best position, and I was also impressive by his excellent mental attributes. I started my spell with two wins against Palermo and Cagliari, but the inconsistency is plain to see with very mixed results. This is down to the imbalanced nature of the squad, along with low tactical familiarity. I mainly used my defensive 4-1-4-1 system, but I was only focused on accumulating enough points to avoid a relegation battle, which I did by ending the season in 13th place. Now that the season has ended I can begin the rebuilding process, and in the next post I will outline the tactical systems that I plan to use for the 2023/24 campaign.